Here's my deep-sky project for the months of June to October, 2016. 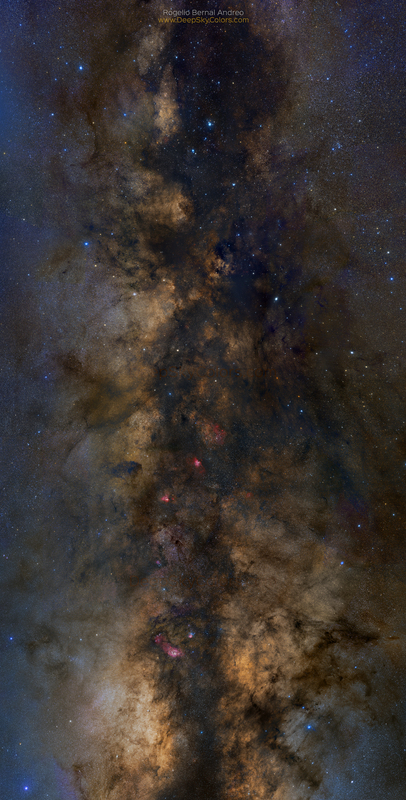 It's a 108-panes (approx) mosaic of a fun area in the Milky Way and roughly about 130 hours of exposure. The original is over 40,000 pix wide (in landscape orientation), possibly the highest resolution artistic photograph of this whole area to date. That produces a monster JPEG, so here we're sharing a small vertical view - click to see it bigger at about 10% of the original size, which is still pretty big. Technically one could do a 133" long print (3.3 meter) at 300dpi with zero rescaling.